What really would happen if fairy tale characters took the leap into our world? Would modern Americans be ready for all that darkness? The premise of Disney’s newest movie "Enchanted" gets a fresh look with Storyteller.net director and professional K. Sean Buvala in our latest edition of our podcast at storytellerpodcast.net. Listen to the podcast now when you click here right now! Avondale, AZ November 18, 2007- "Fairy tales showing up in the middle of modern life? That’s not new. They’ve been there, in all their twisted goodness, since the beginning of humanity. Fairy tales have been making the leap into the ’modern world’ since human beings first experienced their imagination and understood the differences of good and evil," so says Sean Buvala, a full-time professional storyteller and director of the premier Internet storytelling site, Storyteller.net. And he ought to know. He’s been travelling the United States for more than 21 years sharing tales with adults, teens and children. In the latest Podcast at Storyteller.net, Buvala discusses the role of darkness and challenge in fairy tales. "In the new Disney movie, ’Enchanted,’ the characters get trapped in modern day situations and the movie appears to ask the ’what if’ question. Stories, and fairy tales in particular, however, have been asking that same ’what if’ question for hundreds of years. What if we were confronted between the choices of morality, doing what is right and selfless behavior and the more appealing less sociable behaviors? These confrontations are the core of the meaning of fairy tales." In a genre-busting premise, "Enchanted" puts the pure-love and doe-eyed behaviors of its main characters in the midst of our own seen-it-all society. However, Buvala says these calm, loving behaviors would be nearly unknown to fairy tale characters if they came to life. "In the real versions of fairy tales, there is very little of these types of Disney-nice actions. Rather there are behaviors of deceit, treachery, child abuse, punishment, rewards and swift justice. Fairy tales aren’t the politically correct or sanitized stories of animation. They’re hard-core, ’act right or else’ ultimatums in many cases. Children punished by death, people doomed to walk the earth as ghosts for stealing pennies and losing true love for minor infractions: these would be the behaviors fairy tale characters would expect to see in modern life." The irony of a Disney movie parodying the contemporary understanding of fairy tales is especially fun for Sean Buvala. "The Brothers Grimm would not even recognize the Disney animated versions of ’Sleeping Beauty’ or ’Cinderella.’ In many ways, it seems that Disney made ’Enchanted’ to poke fun at the one-dimensional nature of fairy tale characters. However, those wide-eyed people in our imaginations are Disney’s own spawn. They must be having a fun time ’dis" Enchanting their own dragons." Sean goes further in depth regarding fairy tales in modern life and examines the power a genuine storyteller has with a live audience in the latest podcast at Storyteller.net. The free-of-charge podcast can be found on the front-page of the website at www.storyteller.net or maybe be downloaded at www.storytellerpodcast.net. Will Buvala be seeing the "Enchanted" Movie? "I’ll be in the Disneyland area next week. Maybe I’ll go see it right there in the Downtown Disney attraction," the nationally travelled storyteller says with a wicked grin. Digital Storytelling vs the Oralists? Just adding to this: However, in my opinion, digital storytelling in the classroom is an easy sell. Speaking in broad generalities: Traditional, spoken-style storytelling is a much harder sell. Read books to kids? Teachers do that. Use PowerPoint and Video in their classrooms? Teachers do that. Use storytelling which are person to person narrative processes between students and the rest of the world? Not yet and there is very little understanding of why we "oralists" would want to be or even have a place in the classroom. Digital storytelling is an easy sell. We've been doing it since filmstrips and slide projectors. I took classes on it back in the 80's. Two of our schools in our school district just got new "smart" classroom buildings. By reading the news, you would think that communication has just now been invented since kids can "participate" in their classes. Yep, give me an artist-in-residence week with your kids, allowing me to teach and coach storytelling. Your writing scores will go up, your reading levels will go up and your kids will participate in ways you never thought possible. And you won't once have to plug anything in. And, what I teach them will be used across the curriculum. It's completely portable and can be duplicated by all students regardless of a student's economic situation. Try that with digital storytelling. You can't. I Had Forgotten How Good You Are. "I had forgotten how good you are," they both said. And it was my fault that they forgot. Okay, let me see if I can put in writing what I learned this weekend. Over the weekend, I had a chance to do multiple presentations for an organization. Back in the day, about 10 years ago, I used to work as a storyteller with this group every week, sometimes multiple times per week. For many reasons such as their staff (read that: decision makers) and location change for their group, I had lost touch with many of the members of that organization. I had gotten lazy with my mailing list and dropped people off the list under the assumption that they would not be interested. Ah, did you see that word in there....assumption....assume "means that you make..." Oh, you know the rest of that one. Now, this weekend, after many years of not working with this group, I now had a major event with them, primarily because one of my regular sponsors (who is now based at this location) called me and said, "why aren't you coming up to this place anymore?" That put things in motion, contracts were signed and there I was again. Afterwards, two different people who had seen me work with them "way back when" came up to me separately and said, "I had forgotten how good you are." Although flattered by the evaluations, I asked how come they hadn't been in contact with me for their needs. The both replied that they had lost track of me and that "i stopped getting your mailings so I assumed you weren't doing this anymore." Yes, I know. They might have used the Internet to find me. A reality check here calls us to remember that not everyone (yet) thinks about the Internet when searching for people they know. And 8-10 years ago folks were barely using Email to communicate let alone Googling storytellers. Postal mailing still work. These two people judged my availability based on my mailings. How many bookings and good events had I missed because I stopped sending monthly mailings to these two people? Let's do the math. Let's average a post card, mailed out, to 50 cents each. That's probably too high. Ten years of mailings, 12 months per year gets us 120 mailings. That's $60 each or $120 to both folks over the last 10 years. How many bookings had I missed in ten years with these potential sponsors because I took them off my mailing list? $120 is a fraction of a single booking. I saved myself $1 per month not mailing to these folks who knew "how good you are" but probably lost several thousand dollars in bookings, coaching and performances. There are also lost relationships and lost chances to promote the Art of Storytelling. Remember, they did not ask to be removed. I will always remove someone who asks. Rather, I assumed they wouldn't want to hear from me based on the actions of their leadership. Am I making sense here? Some marketing gurus say that you need at least 50 contacts a year with customers to keep yourself at the top of their minds. I urge my clients to do at least monthly mailings. And now, I'll urge them to never take a potential sponsor off a list unless asked. "I had forgotten how good you are," they said. It was my fault that they forgot. Increase the immersive feel of your gaming world and tap into essential human needs and desires with the power of real storytelling! Learn: What is the basic structure of storytelling? It's got nothing to do with reading books. Experience: What are the dark sides of fairy tales? Why are stories so cleaned up from the original versions? Sean will take you through the "unvarnished versions" of some popular tales. Learn: What are "tale types" and what do they teach about human nature? Tap into these cross-cultural realities and bring new breath to your gaming world! Explore: What is the "Geometry of Storytelling?" Why good storytelling allows every audience to have a unique experience every time. Learn: What is the role of numbers in storytelling? 3 brothers, 7 Ravens, 12 tasks? Learn which numbers have significance and what they can tell you about the story and storyline. Explore: How can the concept of "many voices/one story" help designers? Immerse yourself in quests and game experiences by playing a game of "shifting looks." K. Sean Buvala, a 21 year veteran and master storyteller, is the director of storyteller.net, now celebrating their 10th anniversary online! Working throughout the U.S., he is storytelling, training and presenting to and for corporations, schools, churches and private coaching clients. Sean recently received a 2007 Oracle Award from the National Storytelling Network. He is an approved Roster Artist with the Arizona Commission on the Arts. Sean specializes in the folktales of Ireland and the Brothers Grimm, working with adults and teens. He has a variety of CD's released, ranging from stories for children to a specialty product for teenage guys to unvarnished world folktales. 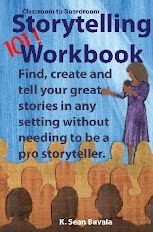 Being able to craft a story is an essential skill for both beginning and experienced tellers. That crafting, much like sculpting, involves knowing what to trim away and what to keep. For storytellers, our sculpting tools should include the red “cross it out” pen. I’ve attended a number of storytelling events of late that bring that old comedy routine to mind. I’ve wanted to hand the tellers a giant red pen, hoping they’d cut out, cross out and eliminate the bloated-ness of their tales. Although it’s not always possible to have a clear cut point in telling folktales or world myths, it is important for storytellers to know “why” they are telling any particular story. If not, stories end up as rambling and meandering exercises in hearing ourselves talk. When that happens, the stories lose their interest and our audiences just lose interest. It is easier to do the red pen routine with personal tales, so let’s begin there. First, understand that storytelling is an audience-centered art form. It’s not a form of therapy for the storyteller. Grab yourself a piece of paper and do this exercise with me. First, choose a personal tale from your repertoire. Then imagine the type of audience you’ll be telling to and with. With those thoughts in mind, ask yourself this: Why am I telling the story? What is my point? Identify this first thought, this singular crystal-clear point and write it across the top of the piece of paper. Use large, bold letters. Underneath those big bold letters, write an outline your story. What’s first, second third.....sixth, etc? Try to include all the elements of your typical telling of that story, including those tangential side trips you might be normally inclined to make. Now comes the step so many tellers are unwilling to make. Grab your red pen. Re-read your main point. Go down your outline and ask yourself for each numbered item, “Does this item illustrate or lead to my main point?” If it does not, cross it out. This is the point where some storytellers start to reach for the oxygen mask. “But, but, what you want me to cut out is (funny, cute, touching, meaningful, pretty, insightful, witty, makes my grandma laugh, tells people I love dogs, will save the world, etc). I couldn’t cut out that part.” Yes, you could. Yes you should. If it does not move your story towards your main point for the audience that you are addressing, then draw a line through it and drop it from you story. Most likely, the parts you’ve redlined are or could become stories in their own way. The process I have just described is a good exercise to do with your storytelling coach. Ask that person to help you identify and redline the excessive parts of your story, those parts that drag down your work. One of the challenges with storytelling as an art from is our excessive focus on internal (“How does your storytelling make you feel?”) coaching, so it may be hard to find a mentor that will be honest with you. You may need to assure your coach that it’s okay to have an opinion. Here's another storytelling Podcast from Storyteller.net and some of our storytellers. You'll hear Brother Sun, Sister Moon do their version of "The Virgin Queen." You'll hear a coaching moment recorded live at on of my workshops. You'll also hear Eva Grayzel do her musically enhanced version of "The Stone Cutter." Come listen now. Click Here to listen. Brought to you by our sponsors at storytellingproducts.com and fulltimestorytelling.com. Thanks for listening. Business Storytelling: Are You Ready for Five Minutes of Fame? Here is my latest challenge for you. Let's pretend that the Woman who runs the World's Largest Afternoon Talk (WLATS) show wants to talk about your business on Her show. You Know Who I mean. She is going to randomly pick an employee from your organization to speak. Let's pretend that YOU have been chosen to represent your company on Her WLATS show. You will have only 5-10 minutes on the show to share your experience and to convince people that they should be calling your company for their needs. Like it or not, 10 minutes on that show can translate into bazillions of contacts. So, you have 5-10 minutes to grab the attention of the audience. What would you say? If you said you'd talk about your financial security, how nice your buildings are and your 24 hour service, then you lose. All of your competitors say they have those, even if they don't. You've got 5-10 minutes. What story, the one that touches the heart and imagination of the audience, will you tell? Stop now and choose one. If you have taken my training work, you have your Intentionality Journal to help you. My training courses give you tools that work. Side note for some of you: This is *not* an exercise in the "elevator speech" process. "Elevator speeches" are dead. Relationships are alive. Stories build relationships. 3. Choose where the story will start. 4. Choose the other episodes that help you get your point across. 5. Choose the ending. Maybe you go back to the opening sentence to close? 6. Find someone and tell them your story. Open your mouth and tell the story. The only way to learn is to do it. This exercise is for everyone in your company. It is for the Executive Team. It is for the new cashier who was just hired this week. "Hah Ha, Very funny. WLATS is going to randomly pick an employee? Oh, that will never happen." you say. Do you want to bet? It is already happening every day. Potential customers, guests and potential employees randomly meet your staff every day. Are all of your current staff ready to tell a story or two? Executive People: Will you model your 5-10 minute talk-show story for the rest of your company within the next seven days? The latest thank-you note I got was from a 7th grade boy. It was written with one of those pencils where the lead changes color every few strokes. It's like a box of crayons exploded all over the letters. Every kid thinks they are the first person to ever write a note with those kind of pencils. Adults couldn't have possibly ever had something so cool as this. In his cascading colors note, he told me that he and his friends thought my stories I told in his school were "exciting." I, of course, thought this note was a classroom assignment. You know, something like: write the Storyteller and say "thank you." Turns out, this was a spontaneous action on this kid's part. He wrote a note, put it in an envelope, got a stamp and sent it. Getting these notes, from adults and kids, is one of the things I really like about being a professional storyteller. When's the last time your (teenagers or students) experienced anything that made them hand write a note...for which they were not getting graded? When was the last time the teens in your life had something that wasn't electric grab their attention so thoroughly? That is the power of live storytelling and that is what I do. I'd like to share with you a little reality. Your customers aren't paying attention to your advertising and sales slogging anymore. They've heard it all before. Numbers no longer slake their thirsts. If you are using the "we're number one" bit, that doesn't impress them. Your "100's of locations" map doesn't matter. You've burned out their patience and their "Broca's" region is turned off. Your old "hard skills" have worn down to fracturing thinness. Yawn. I know, you want to hold on to your slick presentation folders, your staff full of degrees, your nice office building. Your professional self-image. Yikes. So, what are they, your customers, paying attention to? They want you to "surprise Broca." Go ahead and Google that. They're paying attention to and they are thirsting for, the one thing or two that sets you apart. This thing that will scream past their boredom, grab hold of their right-brains and poke them squarely in their mind's eye. than your competitors. Go on, no one's looking. Be honest. Let go of your "corporate mythology" of how your Goliath-ness is David proof. What is different? Your stories? Do you have the most compelling reasons, narratives, records of what keeps your current customers with you? What's the story? Put my money where my mouth is? What's my story? There are lots of storytellers out there. Principals at schools get packages from storytellers all the time. What makes Sean different? Here's one of many things: I capture the attention of Junior High kids so deeply and so that they run to their textbooks and computers when I am done to learn more about the literature and world folktales that I've been teaching and storytelling. When I work with teens, they write me thank you letters afterwards. Yes, handwritten letters. It's amazing. 13 year olds (even guys) writing, even when they don't have to. That's what sets me apart: stories about how teens are motivated to read, research and write when I am done in the classroom. Hold on to your slick handouts and your Powerpoints. Facts are okay and needed. What your customers are going to remember are your stories that frame and focus your number and your facts. Relationships sell. Relationships are built on our stories. They who tell the best story get the sales. They who tell the best story get the most conversion and buy in. This is a hard skill. "Connecting" is no longer an optional skill in business. And after all my blathering above, what you're going to remember is the story about the multi-colored-lead pencils. Why? Because you probably had some when you were a kid or you've bought them for your own kids. Connecting. Dark and cold usually surrounded these moments, but darkness was always required. We’d be gathered with 20 or 200 city teens under the stars, usually standing together in a circle. Sometimes the circle was more clumpy than circular. The depths of how dark it could be, out in the clearing of the forests of Prescott, always astounded them. Their astonishment always astounded me. And, once they turned off their flashlights and were truly surrounded by a smothering blanket of deep night, they would gasp in astonishment. How easy it was to succumb to the darkness, that darkness which we thought we had mastered. Be still and know I am God, you are child." Eventually they’d join me in song. A Cappella singing by teens in the forest: Mind Opening. I was and am moved by the power that even these little bits of light, concentrated in such a small area, can have on people. I found it ironic that although we walk amongst the stars for many nights and months, we seldom look up. How many times have we walked (under near over around) points of light and missed it? Is that storytelling in itself?